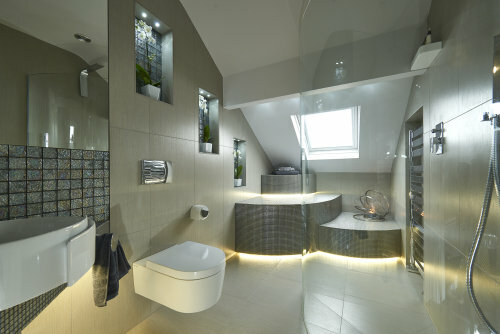 This bathroom occupies a long and narrow space with a sloping roof. The best way to utilise the space under the sloping roof was to create a set of feature steps with LED lights. A bespoke curved shower screen was made to soften this rectangular space. A round sink and storage concealed behind the glass cabinet above the sink make this bathroom practical and attractive. The mirrors and metallic and glass tile mosaics all reflect the available light and visually increase the space.